I found out, at the last minute, I was having two families over for Sunday morning brunch. I pondered what to make and threw out the idea of omelets, pancakes, French Toast and waffles. My thoughts generated to a potato bar or hash browns and that just did not feel right. I did what a smart cook does who has no patience to start pulling out cookbooks. I went to the Internet and came up with a few recipes that motivated me to get into the kitchen. I thought broccoli quiche, potato casserole, blueberry muffins and bagels, lox and cream cheese. that should fill us all up. Heat oil in a large nonstick skillet over medium-high heat. Add onion; sauté 5 minutes. Add broccoli; sauté 3 minutes. Spread broccoli mixture into a 9-inch pie plate coated with cooking spray. Combine milk and next 8 ingredients (milk through eggs) in a large bowl. Pour milk mixture over broccoli mixture; sprinkle with Parmesan. Bake at 350° for 40 minutes or until top is golden and a knife inserted in center comes out clean; let stand 5 minutes. One of my favorites dear Chaya. 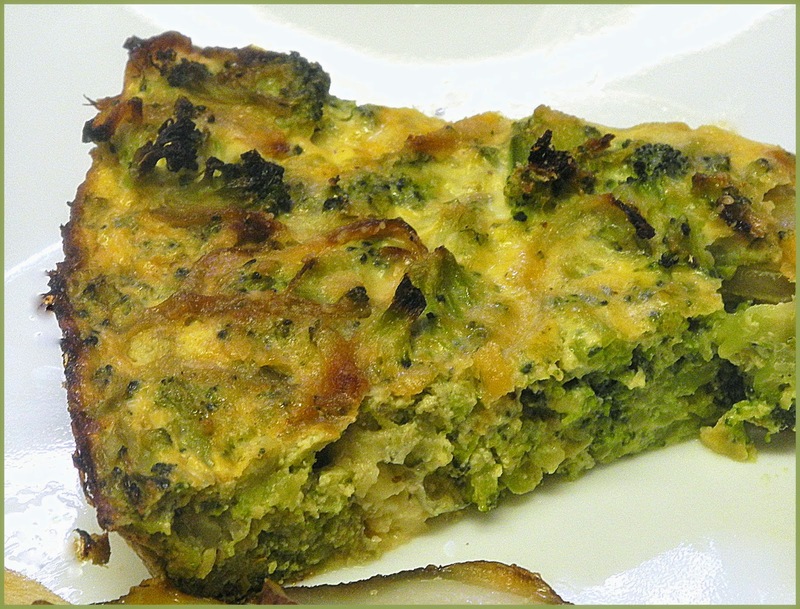 Yum - I love a good crustless quiche! Sounds like you had a great spread of food for your brunch. I remember my late mom used to make a crustless salmon quiche. I never missed the crust! Love your vegetarian version - it sounds scrumptious!